Anyone anxiously waiting for the European Union’s death knell could do worse than circle May 6 on his calendar. That’s when Greece, a nation brought to its knees by an unprecedented economic crisis, is scheduled to hold what promises to be a turbulent parliamentary election. It’s an open question whether Europe’s fragile political balance—and Greece’s tenuous hold on membership in the Eurozone—will survive the subsequent aftershocks. What’s already clear is that life in Greece will never quite be the same. To gauge the extent of the tumult engulfing Greek politics, consider this: Since 1981, when the socialist party PASOK first won power, its combined share of the vote in national elections with the conservative Nea Demokratia, its main rival, has never fallen below 77 percent, and it often exceeded 85 percent. Recent polls for the coming contest give the two parties a joint percentage that lies between 33 and 40 percent. After the last general election, in October 2009, the two parties controlled between them 251 out of the 300 seats in parliament. Now, if the polls are to be believed, they may struggle to get to the 151 seats needed to form a viable coalition government. When the present parliament got its start, it had five political parties. Under the pressures of the economic depression that descended upon the country, those five parties have now split into a total of ten. Polls predict that the new parliament will include at least eight. Shockingly, all recent surveys agree that one of these will be Golden Dawn (Chrysi Augi), a violently xenophobic and pro-Nazi organization which has exploited public anger over the uncontrolled influx of illegal immigrants into the country. The far left, meaning the unrepentantly Stalinist Communist Party and the fissiparous Marxists of SYRIZA, are also expecting their fiery anti-austerity rhetoric to pay electoral dividends—they are both vying for a third place finish. A more longshot but not entirely hopeless contender for third place are the newly minted Independent Greeks, a right-wing party that flirts with sectarian Greek-Orthodox rhetoric, which was founded just last February by Panos Kammenos, a disaffected demagogue who quit Nea Dimokratia because of its support for the tough measures accompanying Greece’s second bailout. Kammenos rails against the “foreign occupation” of Greece by its official lenders and calls for Greece’s debt to be erased. Not too surprisingly, the slogans of the rabid right and the loony left have grown ever more convergent as the crisis has deepened. These “anti-memorandum” extremes—the “memorandum” refers in popular parlance to the terms of the EU-organized loan agreements—display streaks of anti-European and anti-austerity paranoia. They accuse the governments that agreed to the EU bailouts of treason, and suggest the harsh adjustment program imposed on Greece is a Trojan Horse aimed at demolishing Greek workers’ rights and handing over control of the country to foreign investors. More generally, these new parties, on both the left and the right, stubbornly resist any suggestion that the Greeks as a people share any measure of responsibility for the cataclysm that has befallen them. In their story, it is all the fault of foreign bankers and corrupt domestic politicians; the small businessman who never paid any taxes, the civil servant who demanded bribes to do his job, the professional who fought tooth and nail to prevent his sector from being opened to competition, the union man whose inordinate wage demands bankrupted the publicly-owned firm where he worked—these are all innocent bystanders. In the midst of this populist hurricane, the two traditional parties of power are struggling to remain standing. Nea Demokratia, which opposed the first bailout in May 2010 and temporarily saw a surge in popularity because of it, has grudgingly given its support to the second bailout, and has suffered at the polls as a result. But the party is still expected to come out ahead of PASOK. The socialist party—which has dominated recent Greek politics by posing as the protector of the little guy in the factory, the public services, and the professions—was forced to pass draconian austerity legislation in the last couple of years to appease Greece’s official lenders, and as a result has lost all credibility among its traditional base. But it’s not just Greek stubbornness that’s responsible for this state of disrepair. Europe’s leaders have also been unduly obstinate, insisting on austerity as the universal solution for the very different problems of each country in the Eurozone. Their obsession with repeated rounds of wage cuts in Greece, where (especially in the private sector) salaries are now well below the EU average, has also contributed hugely to the country’s problems. Combined with the inability of the Greek political system to push through necessary structural reforms—like the liberalization of closed professions and the elimination of business-killing, corruption-breeding bureaucracy—it has created a deadly mix of economic stagnation, social devastation, and political wrath. 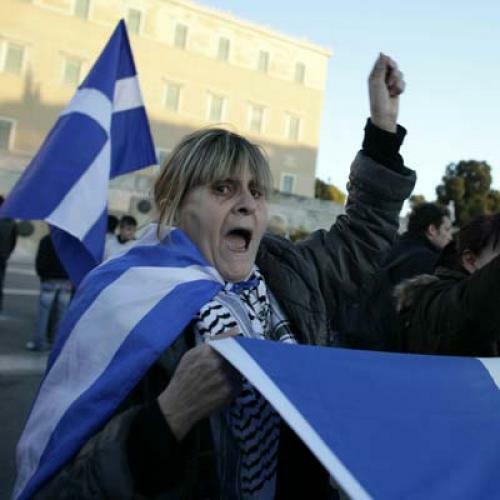 Greek voters will go to the polls to take revenge—on the governing parties, the foreign bankers, the Germans, whomever. The sad reality is that if they vote they way they seem inclined to, Greece will be pushed out of the euro. This will have wide financial and potentially geopolitical ramifications, including for the United States. But the biggest victims of the Greek voters’ choice will be themselves. Yannis Palaiologos is a journalist in Athens, Greece.